You may have heard from an employee or colleague that starting a blog for your business is a good thing. Recently, HubSpot came out with a study providing even more reason to start and maintain a blog for your business: Increased Website Traffic. There is much more in the research including charts and information about inbound links and more indexed pages in search engines so be sure to check it out. Companies are recognizing the benefits of blogging in growing numbers. The companies that are forming strategies and plans around a company blog have an advantage over the competition. 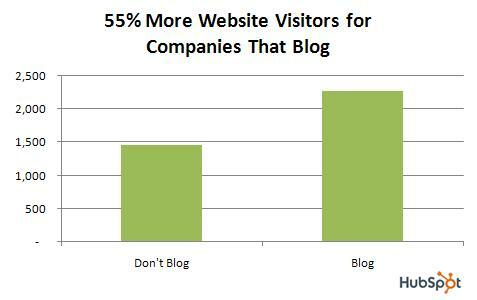 Sales leads, more qualified leads, and overall increased Website authority are all reasons companies are starting blogs. Businesses are looking for ways to target the topics their potential customers are searching for and writing blog posts with valuable content. People are finding these posts via search engines and sharing sites and becoming engaged with the blog and the business. Once you determine that a blog is something you want to pursue the next step is developing a solid plan of action; a strategy for your company blog. During the planning process you’ll need to determine who will actually write the blog posts and maintain the blog. This is crucial because so many blogs will be active for a month or two with frequent posting only to lose their luster and fall by the wayside. Most blogs die before they even have a chance to shine. Develop the correct strategy for your blog and determine the best way to maintain consistent and frequent posting.